Xylovan’s neighbors – and our coming Indiegogo campaign! a) We live on a narrow, link hilly street, buy but most of the neighbors are cool. A Note to Our Neighbors! We’re the family that built Xylovan 4 years ago, and it has delighted thousands of people who have had a chance to play on it wherever it goes. Please know that the vehicle is not abandoned. It’s just awaiting a heart transplant that we can’t yet afford. The engine blew a head gasket last year, so we cannot move it more than a few feet until we can raise the money to buy a new engine. As it turns out – just as we were preparing an online fundraising campaign this month at IndieGogo.com to raise the $5,000 we need – one of you complained to the Parking Authority, and we got a ticket and narrowly avoided having it towed from the street today at even greater cost. It seems we owe you an apology for not having moved it sooner – and perhaps for not talking with you directly about our handmade musical instrument. All of our direct neighbors have told us they are comfortable with its parking place and they enjoy having it around. But we did not reach you – and for that, we are sorry. Please do feel comfortable contacting us directly – we don’t bite – and let us understand your concerns so we can work to address them directly. Xylovan *is* here to stay – it’s part of our lives and the lives of more of your other neighbors than you may realize – and we hope that we can work with you to make you feel more at ease with it as part of our neighborhood together. Here’s the good news – We expect to raise the money within about 30 days and repair the engine soon thereafter. and we will be working all spring to get the van cleaned up, repainted and ready to bring music to more people. So while Xylovan will always be big and a little weird-looking, at least it will look more attractive and move a lot more often. 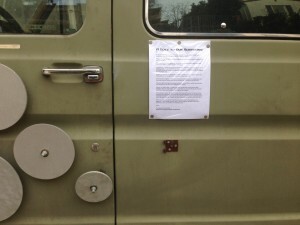 In the meantime, we will try to keep the van parked closer to the neighbors who appreciate it (and farther from your door) – and we hope you will take a little time to learn more about us, and about our musical art car. We really hope they contact us so we can do right by them. We can’t keep paying tickets, and we really can’t park it anywhere substantially different.